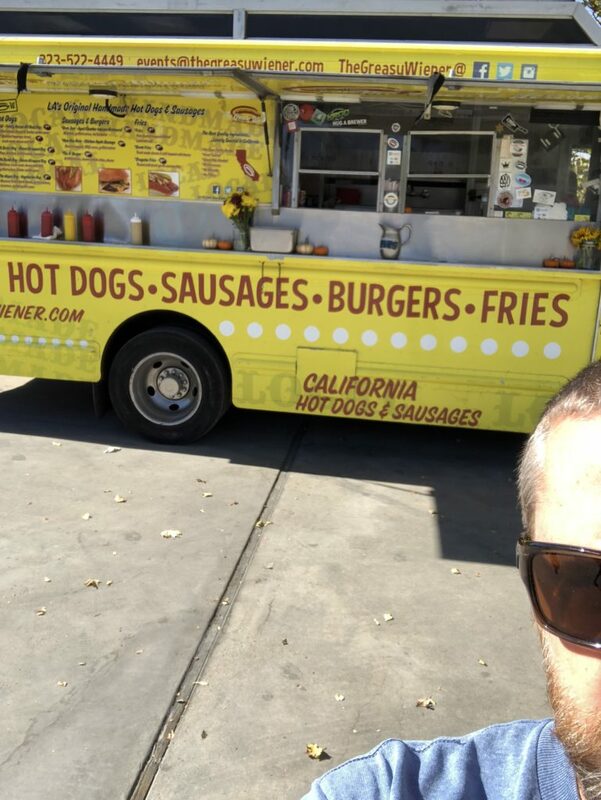 We don’t typically head out in the middle of a Friday for wine and food because we try to be responsible adults who want to get work done first but when I saw that a food truck called The Greasy Wiener was going to be at Eberle Winery…well…we had to go. The Greasy Wiener is an L.A. based food truck but from what I understand, they will be in Paso permanently now. We ended up meeting a couple of friends at Eberle and Mr. Eberle himself joined our table as well. First off, good times for sure. Annie and I shared a hot dog, a burger, and a loaded mound of fries. You can photos in the slideshow below. The food was absolutely amazing. If you hear about The Greasy Winer being some place here’s what you do, drop your plans and go to that place. You will not regret it. We shared a bottle of Eberle Rose with this fabulous meal and great conversation. You can’t forget the absolutely stunning views from Eberle as well. Since our last visit they have added on to that large deck overlooking the vineyards. It looks great and added a lot more seating. Once the Rose bottle was empty, Gary started pouring their latest Cab Sauv. If you know Gary, you know he can’t stand empty glasses. One of the many reasons we love him. Thank you to Gary for hanging out with us. Thanks to Jon and Lisa for meeting us for lunch. And thank you to Ruth who hooked us up with Adam, the owner of The Greasy Wiener. Side note: Eberle Winery has live music and food this Veterans Day Weekend and 40% discount to veterans and active duty every day, year-round. Do they have Tee shirts? They do! Go check out their website for all kinds of cool gear! Cheers!